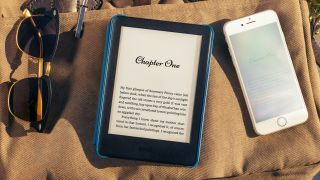 The Amazon-owned Souq.com has launched a new Kindle featuring a front light, marking the first time the illumination tech has been included in the firm's entry-level ereader. You'll be able to adjust the brightness of the light on-screen, allowing you to find the most comfortable level for your surroundings. The screen isn't as sharp as the 300ppi display on the Kindle Paperwhite, but considering that the Paperwhite is almost double the price of the new Kindle that's no surprise. Unlike its pricier siblings however, the new Kindle isn't waterproof, so you'll want to be careful if you plan to take it by the pool when on holiday.